On the ropes with coach Jose Luis Oltra close to being counted out, CD Tenerife trailed 0-2 at half time to CA Osasuna. The score flattered the visiting league leaders, even with three key players missing, Tenerife had matched Osasuna in all but finishing. Home pride was still intact and a stirring second half fight back saw Tenerife claw their way back into the game and grab a late 3-2 winner. Defence became the launch pad for attacking sharpness as January signings, Mauro Dos Santos and Isma Lopez showed what they could do given a full game. 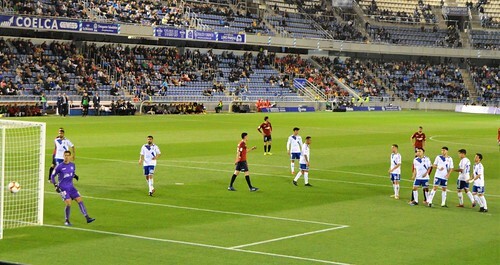 Jorge Saenz was on Spain Under 21 duty, Dos Santos hadn´t played regular games for 10 months and was a gamble as his replacement in the centre of defence. The Argentinian impressed from the start, he looked confident and assured as he denied Brandon an early shot at goal, he made nonsense of his newcomer role by cajoling and encouraging his new team mates. Lopez was another revelation, signed as a left sided midfielder, he filled the left back slot and combined alert defending with a natural urge to raid deep into the Osasuna half. It was easy to see why Osasuna were topping the Second Division, they looked a class act, their game plan was to sit back and absorb pressure before unleashing fast breaks. 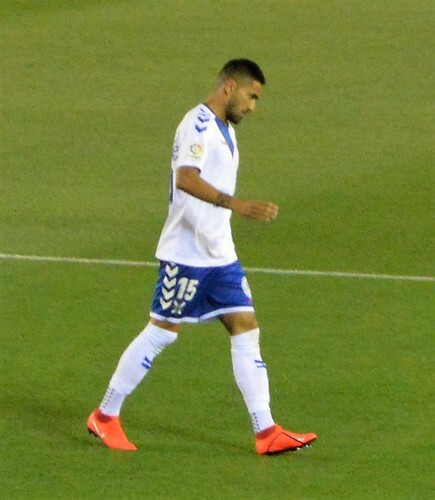 Brandon led their line in the absence of last seasons Tenerife player Juan Villar, he continually tested Alberto, the weak point in the home defence. 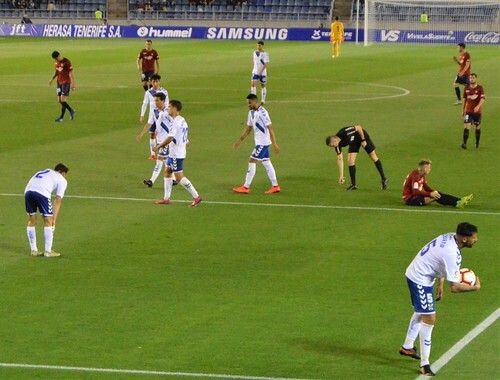 The cutting edge has been very blunt for Tenerife this season but despite missing the creativity of Racic, on Serbia Under 21 duty, and Nano serving a suspension, determination and passion prompted some good attacks. Lasso set up Coniglio whose shot was wayward. A hesitant back pass from Mericia to Osasuna goalie Herrera showed that the top team were not invincible. A three minute spell of brilliance made the difference when the mainland team took a 26th minute lead after some neat passing across the home third that gave Ibanez an easy goal. There wasn’t time for Tenerife to regroup, another flowing move saw Brandon place the ball inside Dani at the post from an acute angle. 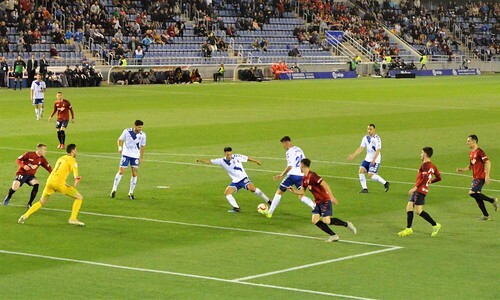 Undabarrena blasted a long shot wide, and Montañes couldn´t make the most of a pass from Luis Perez, so Tenerife went off with a mountain to climb. It would need a barnstorming second half from Tenerife, and that´s just what they delivered. Lopez pushed forward and forced a save from Herrera and Dani Hernandez ensured the door stayed closed at the other end with a smart save from an Osasuna break. Jose Naranjo was another gamble, replacing Borja Lasso after 55 minutes. The forward has done little to impress his new fans after arriving in the summer but he got stuck in and added to the forward momentum of the blanquiazul. Suso forced a Tenerife corner, it was only half cleared and Garcia jumped to clear a Coniglio header but put the ball in his own net. The tall home forward was inspired to use his head again, this time goalie Herrera grabbed the ball. With 20 minutes left, Oltra made a bold substitution, bringing on Serbian striker Malbasic for Montañes. The big man showed no ill effects from midweek flu, his touch in the box after a Naranjo run made an opening for Lopez to hit the equaliser. 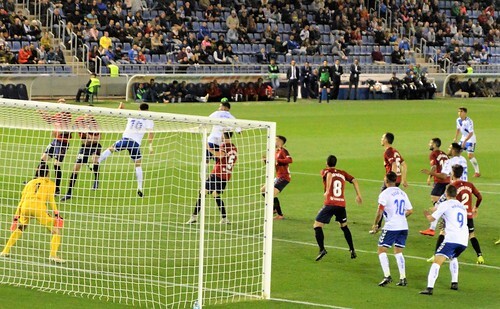 With 10 minutes remaining Dani Hernandez made a vital save to hold out Osasuna, and Lopez grabbed the glory with a well taken goal to put Tenerife in front. Naranjo played a part again, this time he drove through the middle before touching the ball off to Lopez to finish. 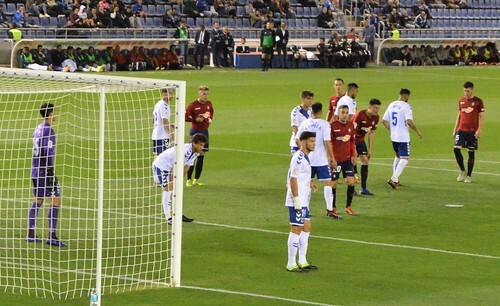 It was a nervous ending with three minutes of injury time added, especially with a last gasp Osasuna shot landing on the top of the home net. Fortune favours the brave, and this was a well deserved win against top opposition. Another five bookings threatens more disruption to the squad but the form of Lopez and Dos Santos gives the coach extra options for the remaining 11 games of the season. Tenerife fans have been cursing the unfair amount of late night Friday kick offs the league give them, this one will be savoured for many years by the 9,356 lucky enough to witness it at first hand.